Nephrotic syndrome is an alteration of kidney function caused by increased glomerular basement membrane permeability to plasma protein (albumin). Altered glomerular permeability result in characteristic symptoms of gross proteinuria, generalized edema (anasarca), hypoalbuminemia, oliguria, and increased serum lipid level (hyperlipidemia). Nephrotic syndrome is classified either by etiology or the histologic changes in the glomerulus. Nephrotic syndrome is further classified into three forms: primary minimal change nephrotic syndrome (MCNS), secondary nephrotic syndrome, and congenital nephrotic syndrome. The most common type of nephrotic syndrome is MCNS (idiopathic type) and it accounts for 80% of cases of nephrotic syndrome. MCNS can occur at any age but usually, the age of onset is during the preschool years. MCNS is also seen more in male children than in female children. Secondary nephrotic syndrome is often associated with secondary renal involvement from systemic diseases. Congenital nephrotic syndrome (CNS) is caused by a rare autosomal recessive gene which is localized on the long arm of chromosome 19. Currently, CNS has a better prognosis due to early management of protein deficiency, nutritional support, continuous cycling peritoneal dialysis (CCPD), and renal transplantation. The prognosis for MCNS is usually good, but relapses are common, and most children respond to treatment. 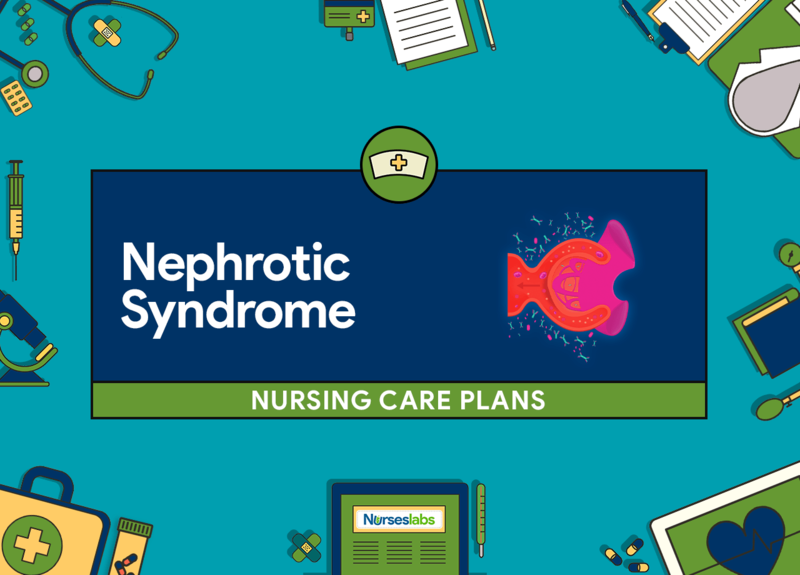 Nursing care planning for a client with nephrotic syndrome include relief from edema, enhance nutritional status, conserve energy, supply sufficient information about the disease, importance of strict compliance with the medication and nutritional therapy, and absence of infection or prevention of a relapse. Child’s edema will be decreased. Child will achieve ideal body weight without excess fluids. Weigh child daily; Utilize same weighing scale every day. Daily body weight is a good indicator of hydration status. A weight gain of more than 0.5 kg/day suggests fluid retention. Strictly monitor and record intake and output. Accurate measurement determines fluid balance. Determine potential sources of excess fluid (e.g., food, medications used) Identification of other sources of excess fluid aids in the therapeutic regimen. Advised to limit fluid intake as ordered. Amount of allowed fluid intake is determined based on child’s weight, urine output and response to treatment. Administer corticosteroid (e.g., prednisone) as prescribed. Corticosteroid therapy continues until the urine is protein free and continues to be normal for 10 days to 2 weeks. A therapeutic response usually occurs in 1 to 3 weeks. Instruct parents to provide frequent oral hygiene. Oral hygiene reduces dryness of mouth and mucous membranes. Teach parents on how to do dipstick urine testing and urine collection and instruct to keep a record of results. Collecting and examining urine for protein shows the gravity of protein loss. Teach parents regarding kidney function and disease condition. Knowing the disease condition enables the parents to follow through with the therapeutic regimen.